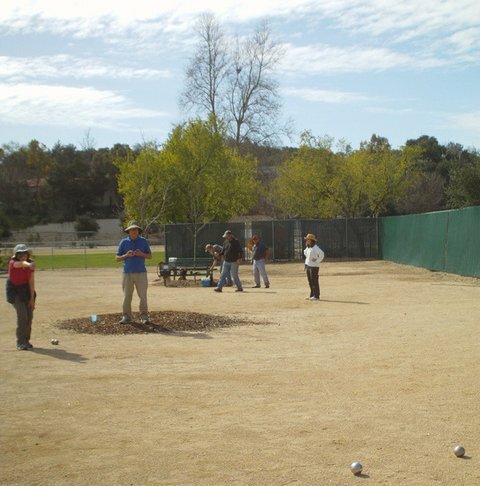 The City of Atascadero maintains a petanque terrain (playing space) open all year. Games are currently played every Sunday and Tuesday. There is no registration, no signup, no fee. Teams are made up on the spot, depending on how many players show up. No petanque balls? No worries! Players always have extras to lend to visitors and newcomers. Never played before? We'll show you how in 60 seconds. Come try out the game! 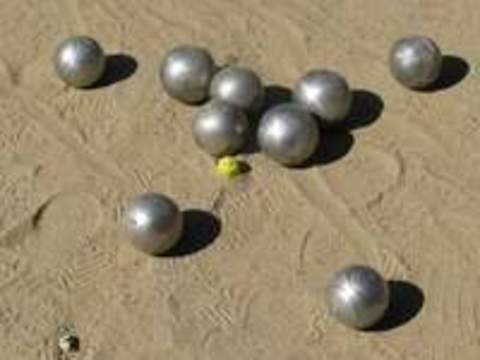 The petanque terrain is located just beyond the basketball courts at the Colony Park Community Center, 5599 Traffic Way, Atascadero CA (sometimes referred to on maps as "Traffic Way Park"). 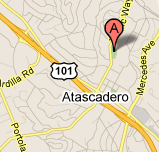 Take the Traffic Way exit off Highway 101, and go east. Stay on Traffic Way through the Colony Shopping District, and past the firehouse. Colony Park Community Center will be on your right, after the National Guard Armory. Click on the map to open up a Google Maps™ window. Doster Wins Gold in Golden Years! 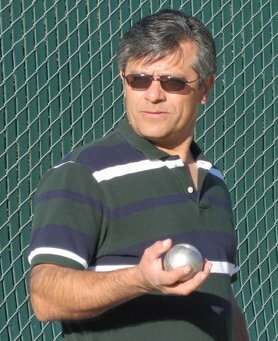 Petanque in Atascadero was started by Nathan Doster. 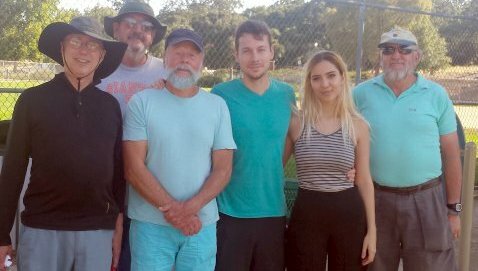 The team of Nathan Doster and Richard Starkey won the gold medal in the annual FPUSA Southwest Region 60-and-over Doubles Tournament. Richard's shooting, including two-boule hits and several carreaux, cleared out the opponents' boules, while Nathan's pointing was relentlessly accurate throughout the tournament. In their final game, Nathan and Richard threw a perfect six-point end (see photo). Way to go, Coach! 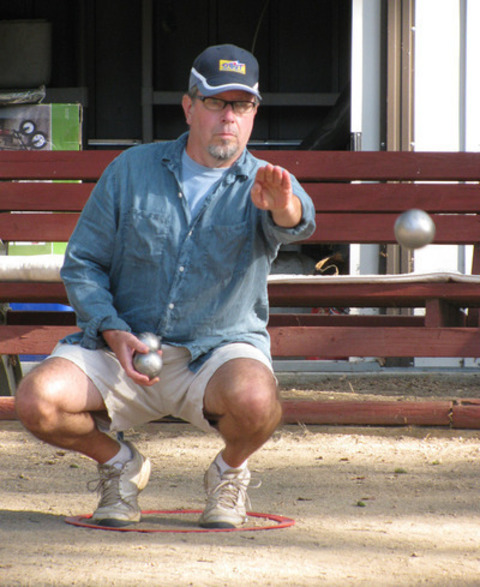 The tournament was hosted by the Oakhurst Petanque Club in Oakhurst, California. 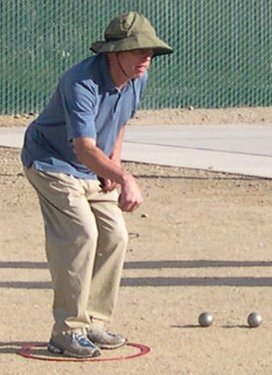 The Southwest Region of the U. S. Petanque Federation comprises Southern California, Nevada, Utah, Colorado, Arizona, New Mexico, and Texas. 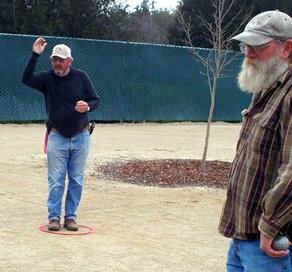 On a vacation trip to Sequoia country, Tom and Dorine decided to see how well the Big Boys could hold their own in petanque. In this photo we see Tom measuring a close point ... notice how he keeps his back to the nearest Sequoia so the big old guy can't see the tape, while Dorine helps out by blocking the other Sequoia's view with her ... jacket. Those Jamasons are crafty competitors! 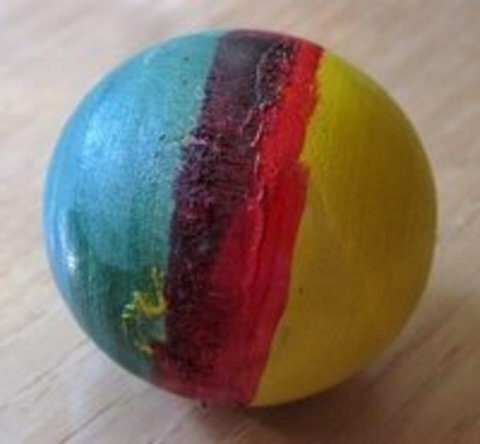 But, sad to say, the Sequoias edged Dorine and Tom 13-11 despite the use of Tom's "Rastafarian cochonet" (see photo). Tom says, "We'll be back! Heck, I didn't even know they could count." 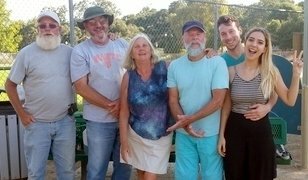 Some of us dressed up for the occasion wearing our petanque shirts, JJ's was from the Bocca Petanque 2000 club in Florida! And Pat and Nathan wore their blinding key-lime-green Central Coast colors proudly for the first time in a while! Always guaranteed to brighten the petanque terrain! The petanque banners were up, and the play was extremely competitive! And an absolute ton-o-fun! Another perfect petanque day on the Central Coast, and this time we had company! 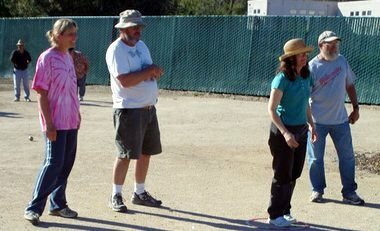 Linda and Carl from the Fresno Petanque Club joined us for a couple of games. They really enjoyed the challenges of our terrain, and we really enjoyed the opportunity to get to know them, and to play with a couple of experienced players! Fresno has 150 members and is the biggest club in the US! 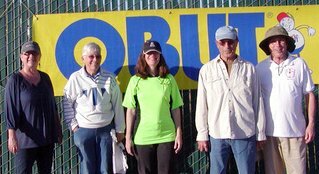 Linda and Carl will talk to their club about coming over en-mass to play with us sometime. Something to look forward to! We had a good turnout, and the warm sunshine made for very pleasant play. Tom's grooming of the surface prior to scheduled play made throwing a delight. Thanks Tom! Cory's shooting was a decisive factor for his team, and Tom's ability to move the cochonnet set his team up for multiple-point ends. The first game of the day started with a 4-point end. The opposing team answered that by moving the cochonnet for a 6-point end! That was followed by a 4-point end for the other team, and a score of 8-6 after just 3 ends. This led to a rule modification suggestion that only ends of 4 points or more count. But the craziness was over as the two teams settled down to trading one- and two-point ends until the score was 12-12. The team of Tom, Cory, and Joan took the final end and the game. The second game was won by the team of John, Pat and Nathan. So everyone went home winners. They were very close games with lots of excellent throws. 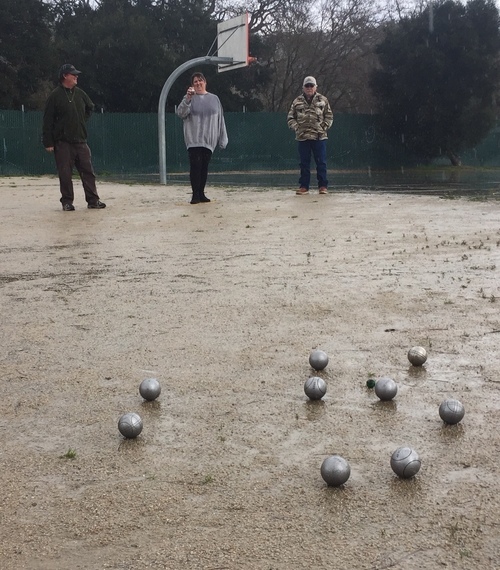 An absolutely perfect petanque day! If Tom starts making even more amazing throws it will be because he has been watching the Masters of Petanque DVD! Certainly he will internalize their incredible skills (as Nathan and others have) and we will all have to learn to deal with it. You, too, can internalize incredible skills by watching the Masters DVDs! Just ask Nathan at the Sunday play session to borrow one.